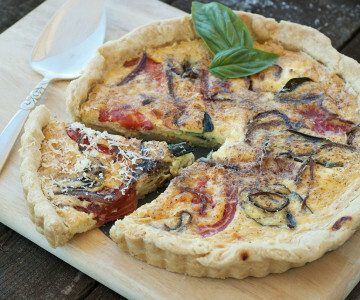 This goats cheese and red onion quiche makes a deliciously indulgent dinner and is surprisingly easy to prepare. We love to enjoy this dish with a simple rocket salad, dressed with lemon and olive oil. Head over to our shopping pages to pick up the eggs, butter and cream you’ll need! Head over to our shopping pages to pick up the eggs, butter and cream you’ll need!